Spicy garlic-sriracha marinated pork strips with crunchy matchstick carrots and thin-sliced radishes make the perfect combination for these homemade spring rolls. If you’re used to “spring rolls” meaning a deep-fried shell full of vaguely mushy vegetables, you’re in for a pleasant surprise from this recipe: the Paleo version doesn’t need deep-frying, because it has actual flavor to make it interesting! You’ll need a batch of your own homemade sriracha to make the marinade for the pork: the store-bought stuff is full of all kinds of junk. The good news is that it’s not difficult; you can find the recipe here. Add some coconut aminos to stand in for soy sauce (you can get these at health-food stores or online) and you’ve got a 100% Paleo flavor punch. You could serve these spring rolls as a side for any Asian-inspired dish (orange chicken maybe, if you’re missing your takeout classics? 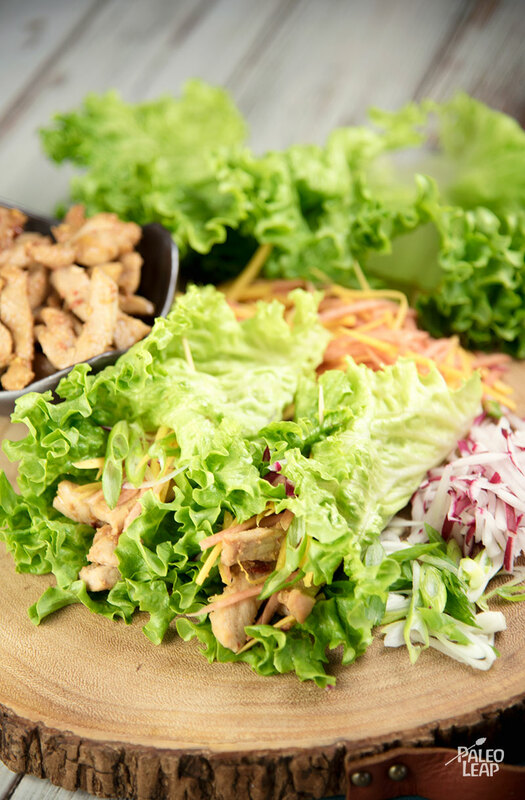 ), but they would also work just fine with some simple grilled meat or another main protein – why not get a little creative and see what you can come up with? SERVES: 4 PREP: 25 min. COOK: 8 min. In a bowl, combine the broth, aminos, ginger, garlic, honey, and Sriracha sauce. Add the sliced pork to the sauce and marinate for at least 15 minutes and up to 12 hours. Melt some cooking fat in a skillet placed over a medium heat, and cook the marinated pork for 5 to 8 minutes or until no longer pink. Let the meat cool down. 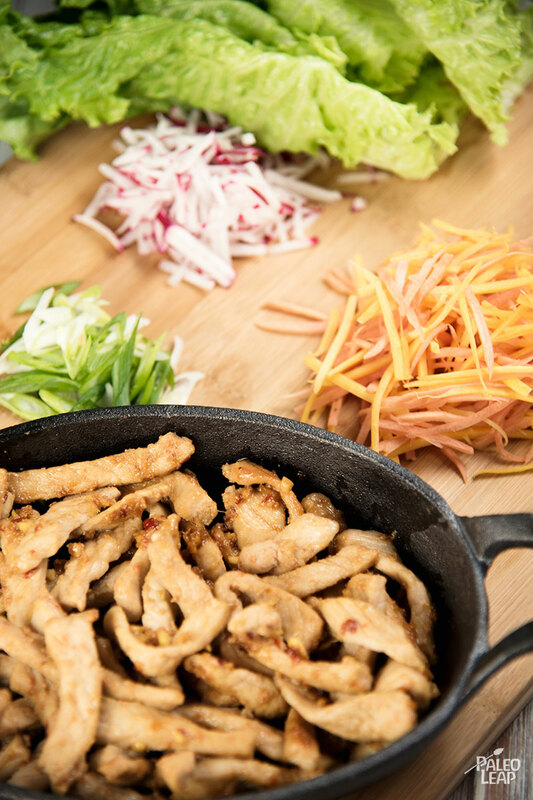 Then construct the rolls: roll the pork in a fresh lettuce leaf with carrots, radishes, and green onions. You may find it helpful to hold each roll together with a toothpick.